ARIS Apartments have been created with our own personal touch & love a small family facility, with modern, romantic, & clean rooms. The apartment is unique with its own balcony & view to the sea or to the picturesque village hills; fully equipped with balcony, safe, fridge, kitchenette & private bathroom. LOCATION: ARIS Apartments are on the central road, which allows easy access to all locations of West Crete. An ideal choice as it is only 200 meters away from a remote, beautiful and pristine beach. About 1.5 kilometres Hardly 1.5 km on the road towards Chania you will find the popular tourist village of Platanias, which during the summer period almost monopolizes the night life of Chania. Transportation is very accessible as there is a regular bus service to and from Chania and a bus stop is right outside our facilities. Every room has a private balcony. Nice stay in a beautiful and peaceful place ! We liked proximity to a peaceful beach, late opening hours supermarkets, restaurants, bakery and to Platanias 15-20 minutes by bus (bus stop at 5mn). TV in our room would have been a plus. We have really appreciated Nadia's family availability and kindness. We recommend this place to openminded and cool people respectful of this family business. Thank you Maria and Nadia ! L'appartamento veniva pulito ogni giorno da Maria e Nadia, sempre a disposizione e gentilissime. Abbiamo passato una piacevolissima vacanza anche grazie a loro! ARIS apartment is great choice when you are in Crete (Chania region). The place is clean, peaceful and well maintained. The Apartment complex is adorable. Very cute and clean rooms with personal touches. The road is quite noisy and the beach is 800 m away, but that is forgotten by the friendliness of Nadia, Maria, and Christos. Also, it is very convenient to have a bakery with very reasonable prices right next door!! Bus stop is 100 m away and a mini markt where you get everything you need for your stay within 500 m from the apartment. Wine glasses, a toaster, a real coffee machine, and a dish scrubber would have been nice to have, but we managed without, but those things may get added to the room we stayed in, 104. Towels get replaced daily if you'd like, beds get made, dishes cleaned, trash taken out, and the apartment swept and mopped, which is really nice to come home to. Only the last night you are there will not be cleaned, so don't be surprised to get home to an unmade room when you depart the next day. We were surprised as we had no clean towels, but as nice as Nadia and Maria are, I contacted them and I had clean towels in the evening. My daughters and I enjoyed our stay very much and recommend it to anyone who wants friendly, clean, and inexpensive accommodations, 30min away from Chania. Appartamenti molto puliti e massima cura dei particolari, ci sono spazi comuni molto ben arredati dove potersi rilassare e fare una chiacchierata... Gerani inoltre è un ottimo punto di partenza per escursioni e giornate in spiaggia, Nadia e Maria sono gentilissime e sopratutto presenti per ogni domanda ed esigenza, tornerei di sicuro!!!! Sono molto felice di avere ospiti persone così belle come voi !!!! 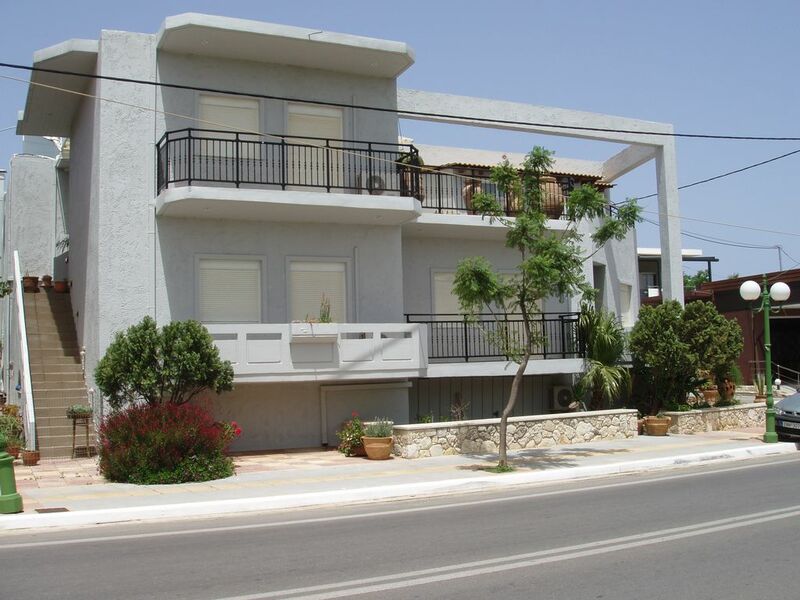 ARIS Apartments are on the central road, which allows easy access to all locations of West Crete. An ideal choice as it is only 200m away from a remote, beautiful & pristine beach. About 1.5 kilometres, hardly 1.5km on the road towards Chania you will find the popular tourist village of Platanias, which during the summer period almost monopolizes the night life of Chania. Transportation is very accessible as there is a regular bus service to & from Chania & a bus stop is right outside our facilities. . This beautiful & graphic village has proven to be a very popular tourist attraction over the years. The settlement has been built along the coast thus providing a beautiful view of the sea & a beach right at your feet. Rates are in Euro, per room, per day valid for 2-5 persons, please add + 5% for extra person. All rooms are equipped with safe box with an extra cost of Euro 7.00 per week if requested. If needed air-condition is available with extra cost. 25% deposit is requested to secure reservation balance to be paid before arrival.